When going through menopause, there are often a lot of signs and symptoms that you would rather not have, including hot flashes, fatigue, and vaginal dryness. While hot flashes are the most prominent symptom of menopause, bloating is also incredibly common, and can be very uncomfortable. The severity and frequency of bloating will depend on each woman and her lifestyle, and there are various signs and symptoms of bloating that also might be felt. 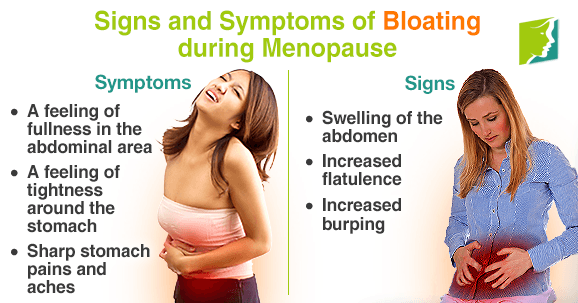 Read on to discover more about bloating during menopause. Bloating is a tight or full feeling in the abdomen that can result in it looking visibly bigger, and becoming painful. It is normally indicative of water retention and increased intestinal gas. Some women might find that bloating is a constant and slow process that happens throughout the day, whereas others might have a more aggressive form that strikes suddenly and is worsened by certain eating habits. Each woman will have different foods that act as a trigger. However, there are general guidelines on things to avoid if you wish to prevent bloating, such as cabbages, onions, milk, garlic, and beans. Many menopausal women experience bloating because of extra gas in the digestive system, so it is best to try to reduce gas build-up as much as possible. Although the nature of the bloating is no different during menopause than at any other time, hormonal imbalances make menopausal women far more susceptible. The reasons behind bloating, however, will be the same as in people from other age groups: dietary habits, speed of eating, and drinks consumed, to name a few. In order to manage bloating during menopause, it is advisable to make a few changes to your normal routine. This means cutting down on the consumption of salt, eating plenty of fiber, eating in a sitting position, chewing more slowly to avoid swallowing air, and keeping hydrated. This will reduce or stop bloating for most women, but if it persists, it can be treated with certain medications. The condition can also be indicative of irritable bowel syndrome (IBS). In this case, it is advisable to see your doctor in order to work out how best to deal with it. For further information on how to deal with bloating and other menopausal symptoms follow this link. Menopausal women can find themselves suffering from constant abdominal bloating, which can cause great frustration and distress. However, it is treatable.